TIP: Calculate 1 lb (450 g) per person. Or if you want leftovers, count on 1.5 lbs (700 g) per person. 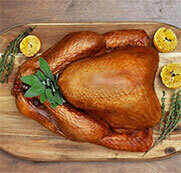 Check our WHOLE TURKEY CALCULATOR to find out what size of turkey to by. Turkeys are graded according to quality of appearance. Canada Grade A turkeys are well shaped and meaty with even fat covering. Canada Utility turkeys are birds with minor skin tears or one or more parts missing which in no way affects the quality. Use these turkeys for cutting up or when carving before serving. “There is no quality or taste difference between a Canada Grade A turkey or Utility grade turkey”. All turkeys processed in a federally inspected plant bear a “Canada Approved” or “Canada” health inspection stamp. This stamp tells you that the product is safe to eat.